A few months ago we went to visit a new church that a couple of friends of ours got involved at. Given the nature of this blog I should clarify: a couple of straight friends. We entered the church and made our usual procession past the overly happy greeter who got excited when she saw I was carrying a Dutch Bros drink. I think we bonded. As we reached our seats, an old co-worker of my husband's (and old acquaintance of mine) sat down behind us to say "Hi". We exchanged a couple of awkward topics of conversation and they continued on to their seats. I had gotten my hopes up that they would sit behind or with us, but I'm not sure we were on that sort of level after discussions of weather and catching up on our jobs. As the service began and something started inside of me. This weird thing happens to me virtually every week, something that I'm not sure I've even shared with my partner: I get ridiculously encouraged about living between these two communities—the gay community and the Christian community. This flood of strength hits me and by the end of the hour-long service I genuinely feel recharged to take on this pursuit of finding community in a church of varied theologies and showing that Church to the LGBTQ community. ...all the prior encouragement I experienced in this service was gone as the hard truth of my predicament settled in: I'm still not comfortable here. However, this Sunday was slightly different. As the service progressed my encouragement soared per usual, but then we reached the prayer time. It was at that single point in the service where I try to make sure that I am connected to my partner. I secretly slid my hand over to touch his leg. 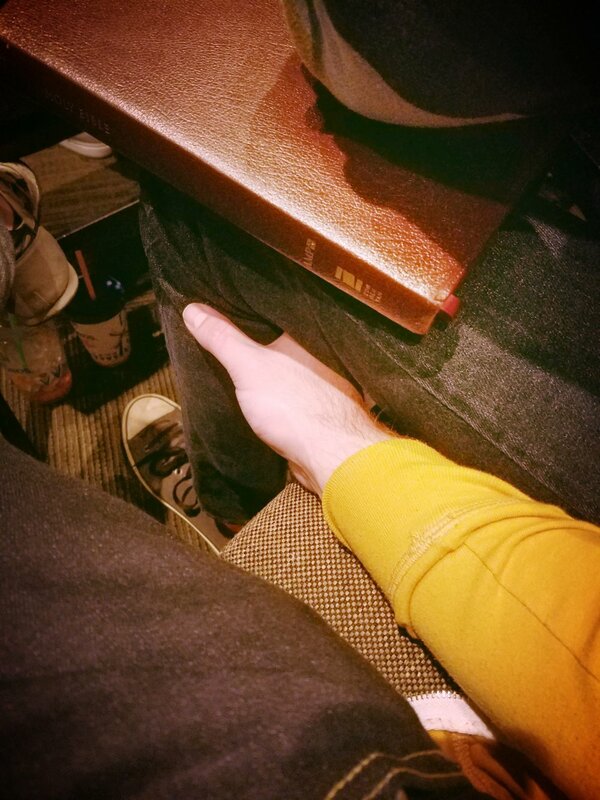 As the prayer started, I opened my eyes and looked down (and I actually took this picture with my phone) and saw my hand: Hidden under his leg, discreet in hopes that the people sitting next to us wouldn't notice. This may not seem like a huge deal to most, but for me, all the prior encouragement I'd experienced in this service was gone as the hard truth of my predicament settled in: I'm still not comfortable here. For the past three years, we've attended church, sang songs, listened to messages – attending in hopes of finding community, but this Sunday I finally realized that I actually feel less comfortable in the Church. Throughout the course of our relationship, we've attended church consistently, taking time to branch out to other churches to see if we can find a congregation that we feel more in sync with. However, as time passes, I've realized that each time we attend a new church, I feel like it's a gamble of if we'll be accepted or not. I leave a new church wondering if we'd fit in without frustrating anyone with our sexuality. It's as if, in one Sunday's visit, I can make a valid assessment of this congregation's ability to handle a seeming "outsider". The most pathetic part of it is: I've never really been rejected at a new church, because I've not actually tried to pursue anything more than a Sunday service. Three years ago, at the outset of our relationship I promised to show my husband the type of Christian community that I've experienced. A community that's loving, a community that has fun, a community that has a deeper and more challenging conversation, a community that helps us live a story close to one that God wants us to live. Unfortunately, to this very day, my husband still doesn't understand what exactly I'm talking about. I think I'm the one to blame for this. I've let my fear of being different consume me. I've adopted a posture of complacency in my life that's allowed me to slip in and slip out of church each week filled with encouragement, but lacking in follow-through. I've started to believe that I can't thrive amid two different communities because doing so will require me to step out of my comfort zone and introduce this person standing next to me as "My husband," and risk getting an odd look in return. Or worse, risk hearing them say, "Oh, I have a friend that is gay, do you know him?" Okay, maybe that last part isn't the worst thing to happen, but hopefully you get the point: Sharing my story feels scary inside the church. While I'm afraid at times, I'm beginning to think that I'm also tired of my own story. I mean, I've stopped writing for over a year because I've given myself over to some sort of incredibly enticing fatigue that often comes with caring about any sort of issue. As a result, I felt like I lost my voice in this dramatic struggle that I'm still very much in the midst of. Until it hit me: I've never really shared my actual story. Sure, I've talked about my situation with enough illusory candor that people can relate to it; but, I've still managed to keep my actual story somewhat masked. So, I think this is where I should resume my project... My story.